Deshabandu Sanath Teran Jayasuriya (Sinhalese: සනත් ටෙරාන් ජයසූරිය; born 30 June 1969) is a former Sri Lankan cricketer and a former captain of the Sri Lankan national cricket team. Considered as one of the greatest ODI players of all time, Jayasuriya is well known for his powerful striking and match winning all-round performances in One Day International cricket. Jayasuriya is credited for having revolutionized One Day International cricket with his explosive batting with Romesh Kaluwitharana in 1996, which initiated the hard-hitting modern day batting strategy of all nations. Jayasuriya was an all-rounder, who had an international cricket career that spread over two decades, He is the only player to score over 12,000 runs and capture more than 300 wickets in One Day International cricket, and hence regarded as one of the best all rounders in the history of limited-overs cricket. He was named the Most Valuable Player of 1996 Cricket World Cup and Wisden Cricketers' Almanack broke an age old tradition by naming him one of Five Cricketers’ of the Year 1997 despite not playing the previous season in England. Jayasuriya was also the captain of the Sri Lankan cricket team from 1999 to 2003. Sanath Jayasuriya was born in the Southern Sri Lankan city of Matara, to the family of Dunstan and Breeda Jayasuriya. He has an elder brother, Chandana Jayasuriya. He was educated at St. Servatius' College, Matara, where his cricketing talents were nourished by his school principal, G.L. Galappathy, and cricket coach, Lionel Wagasinghe. He excelled in cricket while at St. Servatius College, Matara and captained the college cricket team at the annual St. Thomas'–St. Servatius Cricket Encounter in 1988. Jayasuriya was picked as the 'Observer Schoolboy Cricketer of the Year' in the Outstation Segment in 1988. He also received the awards for the 'Best Batsman' and 'Best All-rounder' in the Outstation Segment at the Observer School Cricket Awards ceremony in the same year. Jayasuriya represented Sri Lanka in the inaugural ICC Under-19 Cricket World Cup which was held in Australia in 1988 and was subsequently selected for a tour in Pakistan a few months later with the Sri Lanka 'B' team, where he made two unbeaten double centuries. Shortly afterwards he was drafted into the national side for the tour to Australia in 1989–90. He made his One Day International debut against Australia at Melbourne on Boxing Day of 1989 and his Test debut against New Zealand at Hamilton in February 1991. Along with his opening partner Romesh Kaluwitharana, Jayasuriya revolutionized One Day International batting with his aggressive tactics during the 1996 Cricket World Cup, a strategy they first tried on the preceding tour of Australia. The tactic used was to take advantage of the early fielding restrictions by smashing the opening bowlers to all parts of the cricket ground, particularly by lofting their deliveries over the mandatory infielders, rather than the established tactic of building up momentum gradually. This was a novel but potentially match-winning tactic at that time, and Sri Lanka, who had previously never made it out of the preliminary rounds, went on to win the World Cup without a single defeat. Their new gameplan is now the standard opening batting strategy in limited overs cricket for the modern era. Glenn McGrath cited Jayasuriya in his XI of toughest batsmen, noting "it is always a massive compliment to someone to say they changed the game, and his storming innings in the 1996 World Cup changed everyone's thinking about how to start innings." Jayasuriya is known for both cuts and pulls along with his trademark shot, a lofted cut over point. He was one of the key players in Sri Lanka's victory in the 1996 Cricket World Cup, where he was adjudged Man of the Tournament in recognition of his all-round contributions. His philosophy towards batting is summarized by an all-aggression approach and over the years he has dominated almost every one day bowling combination that he has faced at one stage or another. This is because of his ability to make huge match-winning contributions at rapid pace once he gets in, he holds the record for the second highest number of one day centuries and has scored the second most 150+ scores (4 scores) (Sachin Tendulkar has the most 150+ scores at 5). His devastating performances have ensured that Sri Lanka have won almost 80% of the matches that he scored over 50 runs in limited overs cricket. When asked in an interview who are the most challenging bowlers he had faced in the game, he named in the order Wasim Akram, Shane Warne, Glenn McGrath, Courtney Walsh, Curtly Ambrose. Jayasuriya's highest ODI score is 189 runs, scored against India in Sharjah in 2000. It remains the highest ODI score by a Sri Lankan, and at the time of the innings it was the third-highestNote 1 in ODI history. Currently the score is 11th highest ODI score of all time and highest by a Sri Lankan. Jayasuriya was the previous record-holder for the fastest century (off 48 balls), before losing that to Shahid Afridi's 37 ball century. This is cited as the first ever fastest century scored in less than 50 balls in world cricket. The record was then broken by Corey Anderson of New Zealand (36 balls), which is currently held by AB de Villiers of South Africa with 31 ball century. He has also held the world record for most ODI sixes (270 in 441 ODIs), which was surpassed by Shahid Afridi during the 2010 Asia Cup match against Bangladesh. He became the fourth batsman to score more than 10,000 runs and the second batsman to score more than 12,000, and 13,000 runs in the history of ODIs. He also has 28 centuries, the fourth highest in ODIs. He held the record of scoring most runs in an ODI over (30; he has achieved this twice), and first batsman to score over 30 in an over. This record is now held by South Africa's Herschelle Gibbs (36 runs in an over). During the one-day Natwest series in May 2006 in England, he scored two centuries, including scoring 152 off 99 balls in the final match. In that innings, he and Upul Tharanga (109) put on 286 runs for the first wicket, a new record. 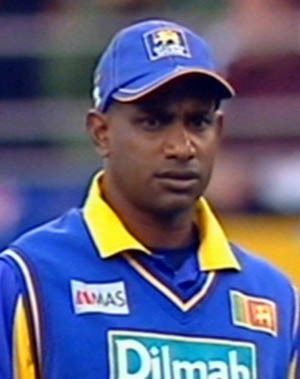 Jayasuriya's batting display earned him the Man of the Series award as Sri Lanka whitewashed England for the first time in their home soil by winning the series 5–0. He also scored 2 centuries and 2 half-centuries in the 2007 Cricket World Cup held in the West Indies.In 2008, his one-day career was all but over when he was omitted for the ODIs in the West Indies. However, a stirring performance in the IPL—finishing the third-highest run-getter with 514 runs—prompted his country's sports minister to intervene in his selection for the Asia Cup. He ultimately shaped Sri Lanka's title victory with a blistering hundred under pressure. His international career has been revived at the age of 41, after being recalled to the One-day and Twenty-20 squads for Sri Lanka's 2011 tour of England and Scotland. During the 2007 ICC World Twenty20, Jayasuriya appeared to break his tradition of using Kookaburra bats by wielding a normal Reebok sponsored bat. He achieved two half centuries in the group stages against New Zealand and Kenya in this tournament. He also shares a dubious record with James Anderson for having the most expensive figures in a Twenty20 international, having been hit for 64 runs in the maximum of 4 overs. 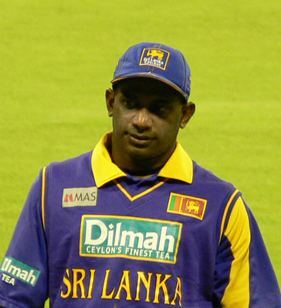 After the Twenty20 World Cup, Jayasuriya played in Sri Lanka's 3–2 One Day International series defeat against England, achieving limited success and then in the 2–0 Test series defeat in Australia. In December 2007, Jayasuriya confirmed that he has signed for Warwickshire for the Twenty20 Cup. In April 2008, he joined the Mumbai Indians to play in the Indian Premier League T20. After scoring a devastating 114 not out off just 48 balls for the Mumbai Indians against Chennai, Jayasuriya regained his position in the one-day side after he had been dropped for the West Indies tour. He then followed up his century with a 17-ball 48 not out to surpass the Kolkata Knight Riders' score of 67 in just the 6th over, resulting in the biggest victory in Twenty20 history in terms of balls remaining. In 2010 has signed with Worcestershire for their Twenty20 campaign. At the age of 42, Jayasuriya played for the Ruhuna Rhinos in the qualifying round of the 2011 Champions League. In February 2012 Jayasuria played for the Khulna Royal Bengals in the inaugural Bangladesh Premier League, later that year he played for Kandurata Warriors in the inaugural Sri Lanka Premier League. Jayasuriya was appointed as the chairman of selectors of national cricket team on 28 January 2013 by sports minister Mahindananda Aluthgamage. The selection panel included Jayasuriya, Pramodya Wickramasinghe, Eric Upashantha, Chaminda Mendis and Hemantha Wickramaratne. But on 30 January 2013, Wickramaratne has been replaced by Hashan Tillakaratne. Under his selection, Sri Lanka won 2014 ICC World Twenty20, 2014 Asia Cup and Sri Lanka's first ever full series win in England in all three formats of the game Tests, ODIs and T20s. His tenure was ended in 2015, after many failures apart from those wins, such as whitewash against India and 2015 World Cup failure. 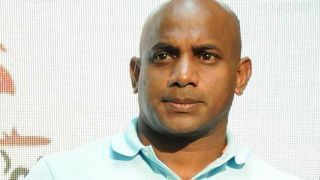 After Jayasuriya's quit, Aravinda de Silva has appointed as the Chairman of selectors. On 11 April 2016, Jayasuriya was appointed back again to the post of chairman of selectors. This time, under his selection, many players got test, ODI and T20I caps and the team shuffled so many times due to many injuries to major players. During this period, Sri Lanka lost world No. 1 rankings in T20Is, lost many bilateral tours to New Zealand, England, India, Pakistan, South Africa. Despite them, Sri Lanka lost their first bilateral ODI series to Zimbabwe at home, Bangladesh drawn all formats in Sri Lanka, Sri Lanka quit very early from both 2016 World Twenty20, and 2017 ICC Champions Trophy. Sanath jayasuriya's first marriage was with Air Lanka ground hostess Sumudu Karunanayake in 1998 which lasted less then a year. Then early in the year 2000, he got married to Sandra De Silva, a former flight attendant of Sri lankan air lines. 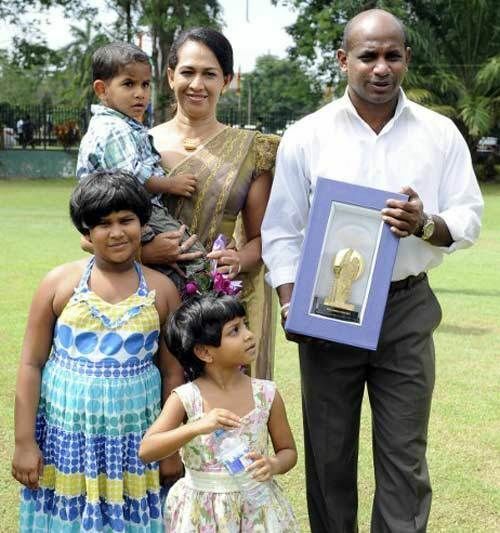 Sanath and Sandra have 3 children Savindi Jayasuriya, Yalindi Jayasuriya and Ranuka Jayasuriya. Sanath divorced from Sandra in 2012. He is also the first cricketer to be appointed as a UN Goodwill Ambassador (by UNAIDS, Geneva) for his commitment to prevention of HIV/AIDS among young people in Sri Lanka. He entered politics in February 2010 as a candidate for Matara District. His party is the United People's Freedom Alliance (UPFA) of president Mahinda Rajapaksa. Jayasuriya continued to play cricket after he has secured the most number of preferential votes from the Matara District by obtaining 74,352 votes. Jayasuriya made his ODI debut in 1989, and started playing as an opening batsman in 1993. He went on to score his first century in 1994 against New Zealand. From then on, Jayasuriya has scored the highest number of ODI centuries for Sri Lanka with 28 to his name. He currently holds the third place for most centuries in a career, behind Indian cricketer Sachin Tendulkar (with 49 ODI centuries) and Ricky Ponting (30 centuries). His second century, 134 against Pakistan in 1996, was scored at a strike rate of 206.15 and was the fastest century in ODI cricket at the time. This record was later broken by Pakistani cricketer Shahid Afridi. The 189 he made against India in 2000 is the sixth highest ODI score in a single innings. Making his second highest ODI score of 157 against the Netherlands in 2006, Jayasuriya paved the way for Sri Lanka to set the world record for the highest ODI team total of 443/9. With his 107 against India on 28 January 2009, Jayasuriya—39 years and 212 days old at the time—became the oldest player to score a century, which was surpassed by UAE batsman Khurram Khan and also became the second player to score more than 13,000 runs in a career. Sanath Jayasuriya also holds the record of fourth fastest 150 in one day internationals. he made 152 vs England at Leeds on 1 July 2006, off just 99 balls which was the fastest at that time, and now after AB de Villiers 63 ball 150, Shane Watson 93 ball 150, and Luke Ronchi 95 ball 150. He holds the highestNote 2 ODI innings by a Sri Lankan, scored 189 runs in 2000. It is the 11th highest of all time. He holds the record for the joint second fastest fifty in ODIs along with Kusal Perera, scored off just 17 balls. AB de Villiers holds the record for the fastest fifty by just 16 balls. Jayasuriya's record stayed about 19 years without breaking it until De Villiers surpassed it on 18 January 2015. Jayasuriya holds the record for fourth highest fours in an ODI innings, 24 fours. Record for highest no. of fours in an inning is for Rohit Sharma (India) 33 fours vs Sri-Lanka in 2014. He is currently the fourth highest run scorer in ODIs with 13,430 runs. (Sachin Tendulkar is first with 18,426). Jayasuriya holds the fourth fastest 150 in an ODI innings, off 95 balls against England in 2006. Fastest 150 was scored by AB de Villiers in 2015 against West Indies, scored 150 by 63 balls. He is the only ODI cricketer with more than 12,000 runs and 300 wickets. He is currently the third highest centurion in ODIs with 28 under his belt (only Ponting (30), Kohli(30) and Tendulkar (49) have more. He is the third batsman in Test cricket to hit 6 fours in one over. He did this against England in his last Test innings. Sanath Jayasuriya was the first batsman to score 4000+ ODI runs after the age of 35 and he's second to Tillakaratne Dilshan for scoring the most ODI runs after the age of 35.